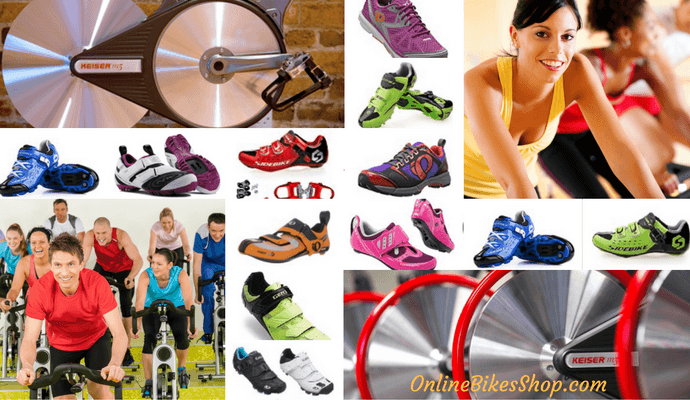 » Spinning Shoes 2019 – How To Choose The Best Indoor Cycling Shoes! Spinning Shoes vs Mountain Bike Shoes? So what is the best spinning shoe for beginners? Dedicated spin shoes or mountain bike shoes? In most cases mountain bike shoes will give you the best value, but some dedicated spin shoes do look cool… Both do the same job. I prefer to use mountain bike shoes with SPD-Cleats because there is such a large selection of Mtb cycling shoes to choose from. This is useful if like me you have odd sized feet? [I have wide feet with a high instep] it is often quite difficult to find good shoes that fit! Spinning in mountain bike shoes solved that sizing problem for me. They are also quite a bit cheaper to buy, that’s a bonus! Why do you need cycling or spinning shoes? The simple move to clipless pedals will make a huge difference to your workouts. Whether you buy mountain bike shoes or a good pair of spinning shoes. isn’t so important. It’s time to push harder, keep up with the rest of the class, including that crazy instructor! There are a couple of good reasons to use mountain bike shoes for spinning. Number one reason, the lower cost. 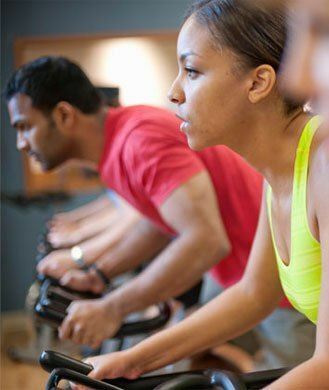 They simply offer the best deal for both men and women when buying shoes for spin class. When buying cycling shoes the vast range sizes for either Men or Women makes buying the correct sized shoe so much easier! Before I buy new spin shoes they need to fit the following criteria. These 4 points are key! It may sound obvious that your new shoe needs to fit well, but when buying spin shoes they need to fit perfectly! The fit is far more important than when you choose your casual shoes or running shoes, with cycling shoes of any type you don’t want them sliding up and down with every pedal stroke. As well as risking blisters this movement has a small, but negative, effect on the how strongly you can pedal. However, many people make the mistake of buying cheap spin shoes that are either, fashionable or they simply look nice. Instead, you should be looking for ultimate fit and comfort, then decide if the shoe fits your budget, and lastly whether it looks good. 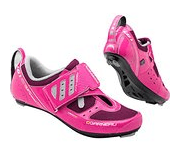 If like many of us, you want to buy your shoes online to save $$$, rest assured, you will find it is super easy to find good indoor cycling shoes online at bargain prices. You do need to be 100% certain of your shoe size to successfully buy spinning shoes online. If you have a high instep or extra wide feet this can be a problem! if all you have to base your decision on is the manufacturer’s listed sizes and a few stock photos. What I always do when buying online is read customer reviews on Amazon they often mention if the shoe sizing is accurate. Amazon buyer reviews often give great sales information for free, be sure to read a few of them before you decide what to buy. when fitting new shoes ideally you want the tip of your big toe to lightly touch or not touch at all. It is critical not to squeeze your foot into a cycling shoe, your foot should not feel cramped in the toe box – cycling shoes don’t stretch out as other shoes will. you need a shoe that holds your foot firmly but still leaves room to move without sliding around, The mountain bike shoes I’m using at the moment are a loose fit but I have found there is enough fine adjustment in the Velcro fastening, as well I use good quality non-slip sports socks to get the perfect fit. Both the length and width of the shoe measurements need to be considered some brands build a narrow shoe, others tend to be wide. If you are buying your spin shoes online, make sure that you can return the shoes if the sizing is totally wrong. The best Spinning Shoe Deals you will find are Mountain Bike Shoes! Road bike shoes, on the other hand normally have a three bolt pattern on the sole and will not work for indoor cycling. Additionally, as already mentioned, I always look for shoes with strong velcro straps they are easier to adjust while still clipped in and allow you to fine-tune the fit. A stiff sole is essential, as it allows a greater transfer of power from your legs to your bike. Once clipped in you need rigid soles that do not flex when you pedal. Also, your shoes need to breathe. Shoes for spinning are normally made of breathable fabric as are mountain bike shoes, it is quite important that your feet get good air flow as you workout. But the first 2 points are the deal breakers. It is fine to shop around for the best price plus try a few different brands to which brand fits your foot shape. But if you are going to be spinning every day and demand the best then I recommend you start your search with Shimano or Specialized Spinning Shoes as they are well recognized for quality cycling shoes – including an excellent range of mountain bike and indoor cycling shoes. 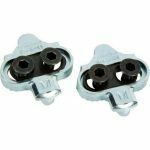 Every manufacturer has a different view of what constitutes the ‘average’ foot, so buying spin shoes online can present problems when looking for the perfect fit. If the shoe you are interested in is popular and has a host of buyer feedback, they will often state if the shoe is true to it’s stated size, if not, you may need to try a few on in a store before you decide on what brand offers the most comfortable fit for you. Foot shape varies widely between riders, oddly enough it is quite common for individual riders to have a slight difference in their foot size (my left foot is slightly smaller than my right foot) and shoe sizing, vary slightly between manufacturers. Shimano spin shoes have the reputation of being a better fit than Specialized spin shoes, but it is an unfair bias, as it is more a case of finding a shoe to fit your own foot – rather than finding a brand that fits every foot. If you have a difficult foot to fit, then you just have to keep on trying all the brands until you find the perfect fit. With your cycling shoes firmly locked on to the pedals, you can expect all of your downward stroke power to be delivered to the pedal. In contrast, when you pedal with running shoes in straps, your foot folds around the pedal as well as slides forward and sideways to the full extent that the straps allow them to – this is not ideal. The rigid soles of cycling shoes support your feet as well as delivers full power to your pedals. Being clipped in also allows you to push down and pull up with each stroke. This gives your legs that little bit more power and increasing the efficiency of your pedal stroke. You can’t get the same benefit from straps and toe cages, once you try clips, you’ll never go back! Apart from driving home the fact that the shoe that fits 100% is the best spinning shoe. The real answer is in the sole. Generally, good spin shoes have rigid soles but not to the point of being thick and heavy. The less flexible the sole the better it is for efficient power transmission. Specialized is one brand (but not the only one) known to make quality shoes with a glass fiber composite soles this offers the stiffness spinners are looking for. Most of the information out there suggests that ideal cleat position is when the center of the ball of the foot is positioned over the center of the pedal axle. This is not crucial for casual spinners, but the higher priced shoes do allow you to adjust the cleat position. But as a general rule for spinners on a bike for an hour or so a day its, not a major selling point, any 2 bolt SPD system will be fine. Adjust your shoe budget to suit the amount of use the shoe will get. An average price for mountain bike shoes is $59.00 to $120.00. 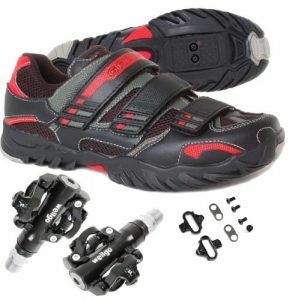 If you are a keen mountain biker as well as a spinner then it is well worth spending top dollar to buy the best spin shoe. You will get lots of use from them spinning in the gym when they are new and clean, then trash them totally on the trails. When they getting a bit too old and smelly for the gym environment. If you worry that for you, spinning is a passing fad, & your expensive spin shoes will end up lost in the back of the broom closet? 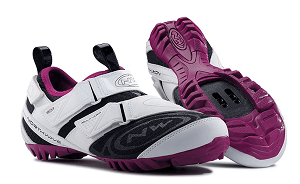 The best deal would be a non-brand mountain bike shoe, if you look for shoes with a high number of sales and good reviews – you may just might find a mountain bike shoe that double as a great spinning shoe for a bargain price? But if you are the type that needs to buy the best spin shoes. There is a bewildering selection of quality shoes and suitable mountain bike shoes on the market from a variety of brands. 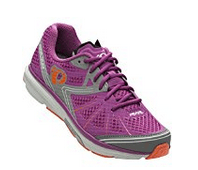 Don’t be seduced into paying top dollar – mid-range pricing is all you need pay to get an excellent spin shoe. If you are buying the high priced bike shoes, (expect to pay $250 – $450.00). Once you find the best fitting shoe then you may as well choose a shoe that allows you to adjust the cleat position – for no other reason than for high priced shoes you can do that. Both Specialized and Shimano allow this their mountain bike shoes and spinning shoes are well designed and survive years of hard use. Best Indoor Exercise Bikes for 2019 – Recumbent vs Upright Bike? 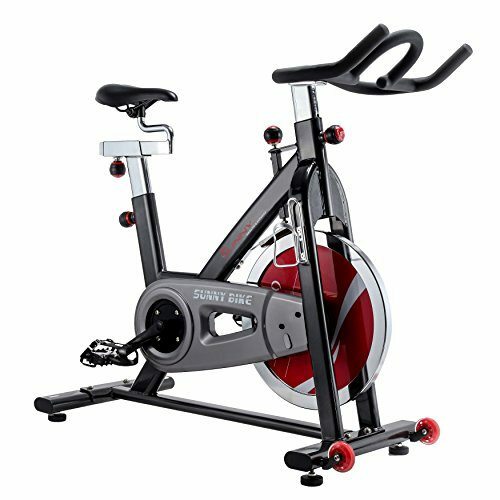 Indoor Cycling Workout – Spin Smarter Sunny Health & Fitness Belt Drive Spin Bike – [2019 Review] 3 Best Spin Bikes For Home Use [Pro Tips 2019] Spinning Benefits – Get Quick Results From Spin Classes! Previous Post Best Indoor Exercise Bikes for 2019 – Recumbent vs Upright Bike? Next Post Keiser M3 Plus & Schwinn AC…Best Spin Bikes For Sale Online! Thanks for the fitting tips for indoor cycling shoes! That seems to be one of my biggest struggles as I never know exactly how shoes are supposed to fit and end up paying for it later. And its a great tip to use mountain bike shoes. Those are available everywhere! I never knew how they are suppose to fit or what to buy. I just started spinning a few months ago with a friend who has been doing it for years. I think I’m ready to purchase a spinning shoe now. I’m willing to pay on the upper end for quality. These are going to last for a while!